Dementia care has taken me to many interesting places, but I’d never imagined Buckingham Palace would be one of them! 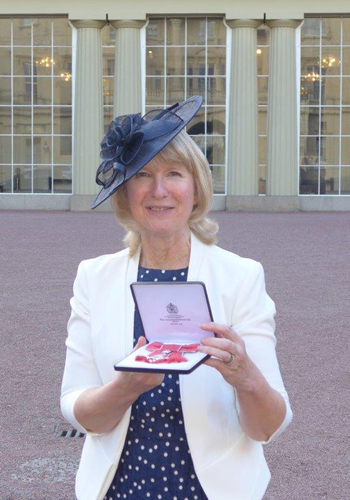 This month, I’ve been there to receive my MBE from the Duke of Cambridge. As you know, he is also campaigning to support mental health, so we had plenty to talk about. Two days earlier, I’d been speaking at the UK Dementia Congress and, as throughout, the warmth of people’s response to the award was overwhelming. The citation was “for services to people with dementia”; people living with dementia, family carers and healthcare professionals have, without exception, been delighted that the importance of dementia care is being highlighted in this way. When the announcement of the award was made in June, I received hundreds of messages – and not just polite acknowledgements, but warm and detailed expressions of happiness. So many individuals and teams are doing all they can to improve the lives of people affected by dementia and they were so pleased to see an acknowledgement of the value placed on those efforts. The work continues, but I hope you have enjoyed sharing one of my more glamorous days in the dementia care campaigning journey.